The 36-year-old Federer also became the oldest man to reach the semifinals at Melbourne Park since Ken Rosewall did it in 1977 at the age of 42. Roger Federer accounted for a long-time rival to set up a semifinal against NextGen champion Hyeon Chung at the Australian Open. 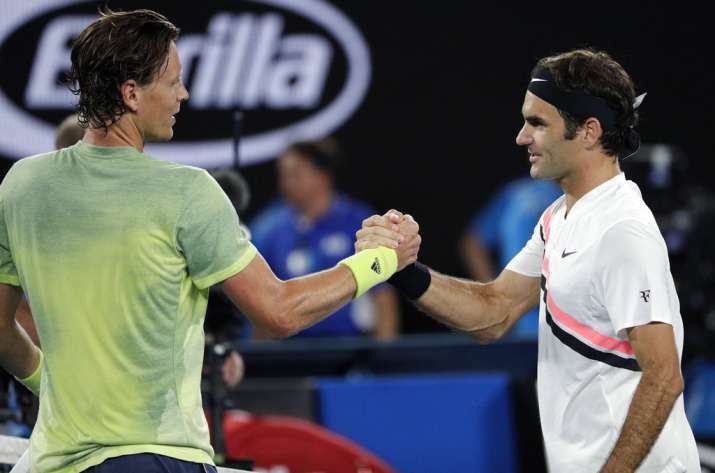 Defending champion Federer's 7-6, 6-3, 6-4 win over Tomas Berdych on Wednesday night extended his winning streak to 14 in Australian Open quarterfinals and to nine in that personal duel. The 19-time major winner leads that head-to-head contest 20-6, including all five meetings at Melbourne Park. The 36-year-old Swiss star overcame a shaky start, dropping his opening service game and uncharacteristically challenging the chair umpire because of a technological fault. "I had to get a bit lucky. A bit angry. A bit frustrated maybe at the umpire," Federer said. "Anyway, glad to get out of that first set. It was key to the match. "That first set could have gone either way. He deserved it, actually. I stole that one a little bit." Chung became the first Korean to make a Grand Slam tennis semifinal when he beat No. 97-ranked Tennys Sandgren 6-4, 7-6 (5), 6-3 in the afternoon match on Rod Laver Arena. The 21-year-old Chung hadn't let up when upsetting No. 4 Alexander Zverev or six-time Australian Open champion Novak Djokovic en route to the quarterfinals, but he let his guard down in the last game and needed six match points and to fend off two break points to hold off Sandgren. "In last game, I think at 40-love ... if I win one more point, I make history in Korea. I have to think about the ceremony, something," he said, explaining how he got slightly ahead of himself. "After deuce, break point. I was like, no, nothing to do with the ceremony. But just keep playing — keep focused." "I think all the people are watching Australian Open now because we make history in Korea," he said. The No. 58-ranked Chung is the lowest-ranked man to reach the Australian Open semifinals since Marat Safin in 2004. He's also the youngest to reach the last four at a major since Marin Cilic did it here in 2010. With Chung already through, and Kyle Edmund playing No. 6 Cilic in the other half of the draw, it's the first time since 1999 that multiple unseeded players have reached the Australian Open semifinals. Federer said he has been impressed with the way the two unseeded players have progressed, particularly Chung's run. "To beat Novak on this court is particularly difficult. ... He's incredibly impressive in his movement, reminds me obviously a lot of Novak," Federer said. "He's clearly got nothing to lose. I will tell myself the same and we'll see what happens."